We operate Wales-wide, are located in Porthcawl on the south Wales coast and work strategically across Wales and in local communities. We are known for challenging the status quo; instigating foreword-thinking projects and activities; providing confidence and direction; offering support, training and facilitating events; providing mentoring and volunteer experiences. We undertake commissions and contracts, and they have been amongst others, on behalf the Welsh Government and Cynnal Cymru, Renew Wales, Arts Council of Wales, Environment Wales and the local authority. We project-manage the high street ethical cooperative SUSSED Wales, which we established in 2006, and coordinate Bridgend Fairtrade Partnership. We have also developed The Green Room, an independent venue and small cultural centre, scheduling a series of events, talks and debates. It is also available for hire. Listen to the podcast. Sustainable Productions, our newly formed film production company, working alongside park6productions, develops professional ways of communicating and sharing ideas. 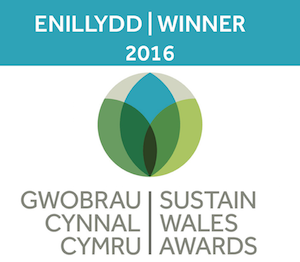 At the Cynnal Cymru annual award ceremony held in Cardiff on 17 November 2016, Margaret Minhinnick (bio) became only the second ever recipient of the ‘Special Recognition Award’, recognising her thirty plus year’s innovative work in environmentalism and sustainability.